The latest version of the software can be downloaded from the CHAI3D website. Open a browser to the following webpage: www.chai3d.org/download/releases. Decide which operating system you wish to use (Windows, Linux or Mac OS X). Download the corresponding archive file for your platform. Uncompress the file to your desired working directory. The recommended development environment under Windows is Microsoft Visual Studio. CHAI3D supports editions 2010, 2012 and 2013. CHAI3D is compatible with the community edition of Visual Studio 2013, which can be downloaded from www.visualstudio.com/products/visual-studio-community-vs.
CHAI3D also supports the Express Edition of Visual Studio, which can be downloaded from www.visualstudio.com/products/visual-studio-express-vs. NOTE: In order for your application to connect successfully to your USB haptic device, please make sure to run your CHAI3D applications with super user privileges (sudo). CHAI3D uses the OpenGL framework to perform 3D graphic rendering. Under the Linux and Mac OS X operating systems, OpenGL drivers are provided by default. If you are using Windows and have installed the operating system directly from a Microsoft Windows Installation CD or DVD, you will need to update your graphic drivers by downloading a fresh copy from the website of your graphics card manufacturer. Note that Microsoft only provides an emulated version of OpenGL using DirectX. Therefore if you are encountering any performance issues with the graphic rendering, OpenGL drivers are among the first things to check. The Force Dimension family of force-feedback interfaces include the omega.x, delta.x and sigma.x haptic devices. On Linux and Mac OS X platforms, the libraries required to support Force Dimension devices are included with CHAI3D so there is nothing else to do. Support for the Falcon haptic device is provided by the Force Dimension drivers. Uninstall all software provided by Novint. Carefully follow all instructions that may be displayed on the screen during uninstallation. Download and install the Force Dimension drivers for your Windows architecture (32- or 64-bit) from the Force Dimension website. Connect your Falcon haptic device. Select "Browse my computer for drivers"
Choose the latest driver (Force Dimension), and you should be ready to go! The supported haptic devices include the Phantom Omni, Phantom Desktop, and Phantom Premium (6-DOF). Please contact 3D Systems to obtain a copy of their latest Windows drivers and a copy of OpenHaptics 3.0 or higher. 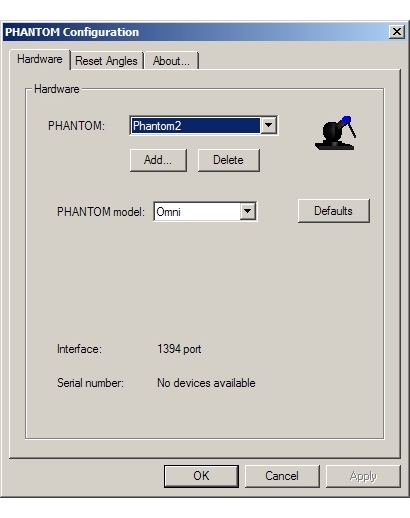 If you wish to use two Phantom devices simultaneously (Windows only), please make sure that you name the second device as "Phantom2". This operation is performed in the main Phantom Configuration Panel program. The only supported device is the Leap Motion Controller. The only supported device is the Razer Hydra.